Just because it was a holiday week, does not mean things were not going on in the United States. The College Football Playoff final is set, Jon Jones is back — amidst controversy in the UFC — and another pitcher from Japan is set to make a splash in MLB. But we will start with controversy this week in U.S. Sports. United States sensation Christian Pulisic is moving on to bigger and better things. The youngest captain in USA's history, has signed with Premier League giants Chelsea from Bundesliga leaders Borussia Dortmund. 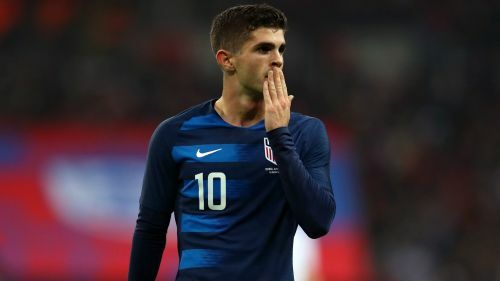 Pulisic joins Chelsea in a deal worth €64million, however, the 20-year-old will be loaned back to Dortmund for the remainder of the 2018-19 season. He has impressed since making breaking through for the Bundesliga side during the 2015-16 campaign and has since made 115 appearances for the first team, scoring 15 goals and creating another 24. But Pulisic has not started in a game since September 29. Another star is coming to MLB from Japan. The Seattle Mariners announced this week they have signed lefty Yusei Kikuchi to a three-year deal worth $43million with an option for a fourth year. Kikuchi spent the last eight seasons with Nippon Professional Baseball's Seibu Lions posting a 74-48 record with a 2.81 ERA. He is coming off a year in which he went 14-4 with a 3.01 ERA. The 27-year-old joins a Seattle squad which finished third in the American League West last season. "I'm very happy to be here. Today is a very special day for my family and I," Kikuchi said, via MLB.com. "Playing in the big leagues has been a dream of mine since I was 15 years old. Thank you, Seibu Lions, for letting me go and live my dream." The College Football Playoff finals are set and this championship will once again feature Alabama and Clemson. Since the beginning of the College Football Playoff in 2014, the Crimson Tide and Tigers have faced off in two national title games and three separate occasions. This year they will be the first and second teams in the country and will both meet with undefeated records. Alabama lead the playoff series 2-1 over the Tigers. The arguably best pound-for-pound fighter in the world is back — under bizarre circumstances. Jon "Bones" Jones defeated Alexander Gustafsson by TKO in the third round to earn the UFC's light heavyweight title on Saturday, but he did so in an event that had to be moved from Nevada to California at the last minute due to a failed drug test on the part of the former. The test allegedly revealed a residual amount left from a previous positive test, but this did not keep Gustafsson or former UFC light heavyweight champion Daniel Cormier from calling Jones out for being a drug user. This however did not stop Jones from beating Gustafsson and calling out Cormier after his victory. "I know there's a guy who's been calling himself champ champ," Jones said in his post-fight interview at The Forum in Inglewood, California. "I mean, what guy just gives up his belt because somebody else made it home? Daddy's home, 'DC'. Prove to the fans you're a champ champ. Come get a taste. I'm here. Get your belt back — it'll be waiting right here." Cormier has long said he does not want to fight Jones again, but with only one official defeat in his career and another loss vacated due to a failed drug test — both in fights with Jones — the UFC's heavyweight champion may be tempted to redeem himself one last time.